Yesterday we flew back from Chicago to San Francisco.Â It was fun visiting relatives, but there’s nothing quite like the joy of sleeping in your own bed!Â The Fuzz (our cat) was ecstatic to see us, and demanded lots of attention (mostly from Mike) to make up for a week and a half of neglect. On the flight back, I read through Jane Dunnewold’s Art Cloth.Â A really fascinating read – she covers a variety of surface design materials (dye, paint, discharge, foil) and a bunch of ways to apply them (painting, stenciling, stamping, and silkscreening), plus a lot of design tips on combining techniques successfully.Â Definitely a winner!Â I came out of it with a lot of ideas for decorating cloth, and an atavistic urge to start silkscreening.Â My family used to silkscreen our own holiday cards – using Chinese paper-cuts for the primary design – and I have fond memories of running all over the house as a child, laying wet silkscreened cards out on the floor to dry.Â I did some more silkscreening in college, and it was one of the most fun things I did while I was there. Plus, I have a whole roll of photo-emulsion sheet that I bought a couple years back, which slowly degenerates over time and (if it’s still any good) ought to be used.Â Great excuse! Anyway, I also spent some time thinking about designing doubleweave using Photoshop and a divided parallel threading.Â Bonnie Inouye had very kindly sent me her article in the February 2007 Complex Weavers Journal, “Double Weave on a Divided Parallel Threading”, back when I was trying to figure out doubleweave.Â Â Her article showed a clear and easy way to understand doubleweave design using tie-up and treadling.Â After using a modification of this method to design triple weave, it occurred to me that one could extend the method to design complex doubleweave (and triple or quadruple weave!) designs in the liftplan, using an adaptation of Marg Coe‘s Photoshop design methods to generate the appropriate design.Â This proved to be a fascinating and very rich area to contemplate.Â I think I will spend more time delving into this, and possibly submit it as a topic for Complex Weavers Seminars.Â Even if I don’t, it’s making me think deeply about doubleweave, which is a Good Thing! 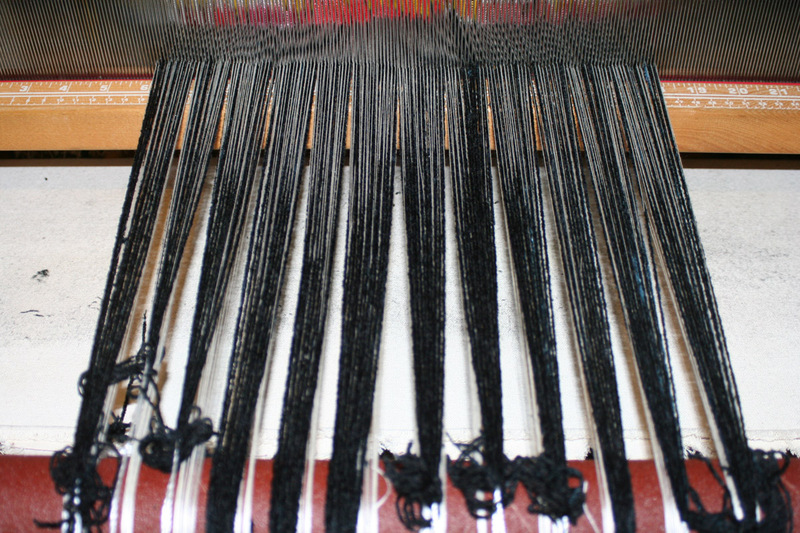 diversified plain weave warp, tied on and ready to weave! By this time, though, it was close to bedtime (an hour or so past bedtime ifÂ you considered the jet lag), and I had been working for five straight hours, so I left the warp and went to bed.Â This morning, after Mike gets up, I’ll start weaving the sample.Â I have corrected the draft (Marg Coe was kind enough to send me an example of a correctly designed diversified plain weave draft, and it showed me where I’d made the error), so all that needs to be done before starting is wind some pirns!